“If you want to know who we are” rang out to capture the attention of the anticipating audience and with the Gilbert and Sullivan song from The Mikado – lyrics skilfully adapted by the choir’s own Jim Lawrie - the Aeolian Male Voice Choir let them know they had arrived to bring to the Grand Hall a varied and entertaining programme of music. Gilbert and Sullivan’s work has been somewhat neglected, and indeed derided, by many in the musical establishment in recent years but if , like me, you have fond memories of school productions of their shows then you were in for a treat. 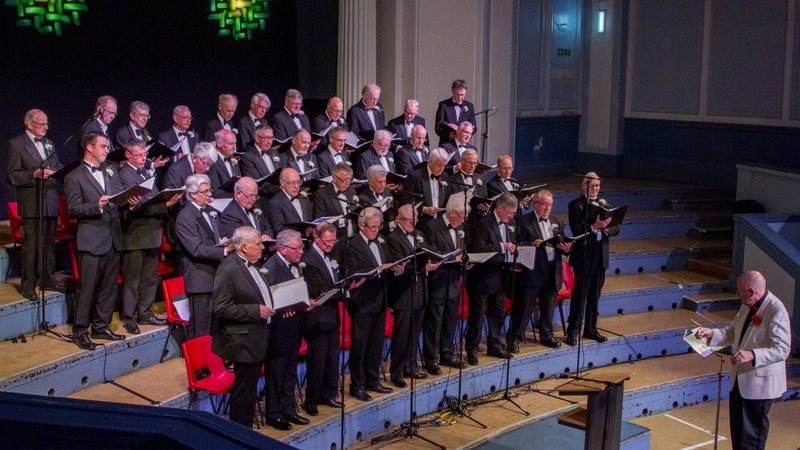 The choir proceeded with a medley of upbeat songs from “The Pirates of Penzance” after which the guest soloists for the evening were introduced by the compere John Goodwin. These were the same as the previous year; Joanna Norman (soprano), Richard Shaffrey (tenor) and their accompanist Erik Garcia all currently studying at The Royal Conservatoire of Scotland (currently ranked third best performing arts college in the world!) representing Australia, Ireland and Spain respectively. For the Gilbert and Sullivan fans they completed the overall coverage of moods contained within The Pirates by giving us, and indeed acting out, the beautifully romantic “Ah, Must I Leave Thee Here?” and “Poor Wandering One”. Joanna and Richard superbly rendered several other popular operatic pieces and, in a break from previous years, we had a piano solo from Erik (I’m sorry, I didn’t catch the title) but it was impressive that during the quiet stretches within it he appeared to produce the sound by caressing the keys rather than striking them. Oh, to be able to play piano like that! During the concert compere John drew attention to the recent participation in the BBC2 quiz show Eggheads of several members of the choir. This, in the tradition of Scottish team events, had resulted in an honourable defeat! Who cares; it’s not winning but taking part that’s important. Speaking of winning, Alex Findlay was the winner of a £50 voucher kindly provided by one of the choir’s programme advertisers, Balmoral Knitwear. Durisdeer is a poem by the 19th Century poet Lady John Scott which has been set to music by Donald Thomson. The choir were proud to be premiering an arrangement for male voices of his beautiful melody specially commissioned from the composer by the Aeolian Male Voice Choir. It had been hoped that Donald would be able to attend to hear it but unfortunately this was not possible. To send the audience home singing, the choir’s last number was Cole Porter’s Don’t Fence Me In which was a song he himself didn’t like much when he wrote it but which grew on him after the royalties cheques started landing on his doormat! President Bill Armour rounded off the evening by thanking all who had worked to get the concert to happen including the wonderful soloists and their accompanist but, on behalf of the choir his special thanks went to Musical Director Alex Ferguson, and his assistant and accompanist David Walker (himself a recent product of The Royal Conservatoire of Scotland). Their efforts, with good humour and patience, in enabling the amateur choir to produce such a professional sound cannot be praised enough. It’s what community involvement with music thrives on. Bring on the 85th Annual Concert!